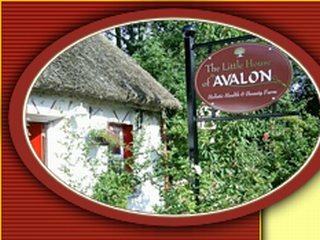 Galway East Tourism - Little House of Avalon in East Galway, West of Ireland.Galway East Tourism - Little House of Avalon in East Galway, West of Ireland. A touch of Laura Ashley and a lot of class make our chalet rooms cosey and comfortable, looking after your every need during your stay. We welcome you to a beautiful, tranquil spot where birds live in abundance, the air is fresh and the water clear. The Little House of Avalon, a welcoming charming place where wholesome country charm is combined with holistic mind and body therapies. Cozy rooms in the over 150 year old thatch roofed cottage or the main house. Our tranquil environment seeps into your very soul as you turn off the main road down the wee b?thar?n with grass running up the middle. B&B / Home Cooking. The only noise to wake you in the mornings is the singing of the birds or the call of the cuckoo - after sleeping peacefully in one of our beautiful tastefully decorated geustrooms, or one of the secluded cosy chalets to a day full of pure relaxation.